More than five years ago, during my second week of professional culinary school, I made my very first eggs benedict from scratch. I arrived to my classroom early and anxiously looked at the white board to see our menu for the day. The famous, sweat-inducing word appeared before me: hollandaise sauce. Traditionally, hollandaise sauce is served with eggs benedict, a classic American breakfast consisting of toasted English muffin halves topped with Canadian ham or bacon, runny poached eggs, and hollandaise sauce. Hollandaise is a sauce made from raw egg yolks, butter, lemon juice, cayenne pepper, and salt. If you’re squeamish about using raw egg yolks, I recommend seeking high-quality eggs from the farmer’s market or pasteurized eggs. While I do occasionally enjoy a classic eggs Benedict, I’ve always preferred more creative and modern spins on the dish. 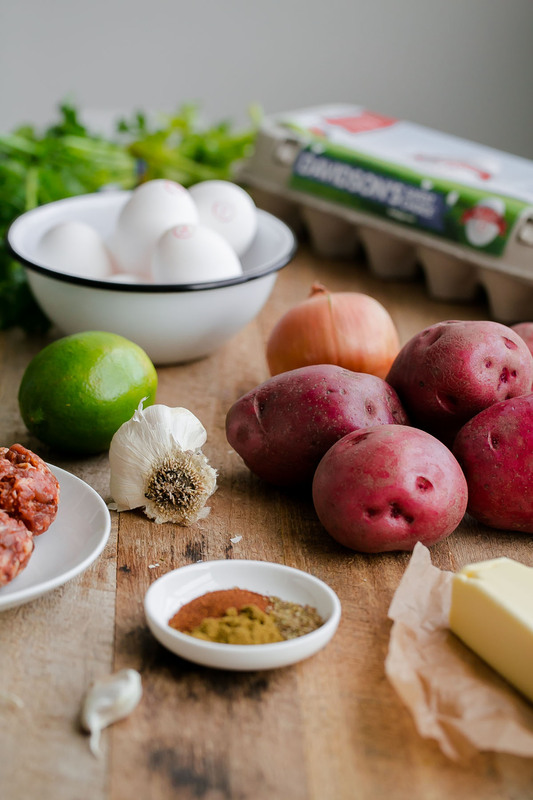 Today’s chorizo hash eggs Benedict was inspired by one of my favorite breakfast spots back in the DC area (which, sadly, is now closed!). 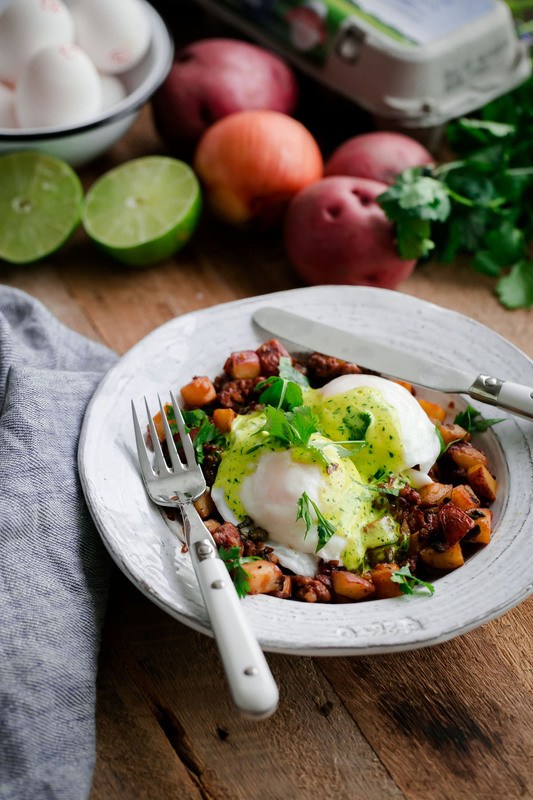 A crispy potato hash was my creative starting point. Instead of sticking with a classic hollandaise sauce, my version uses lime juice (as the main acid) and fresh cilantro. It is so delicious! flavor. English muffins shouldn’t get all the fun, right? 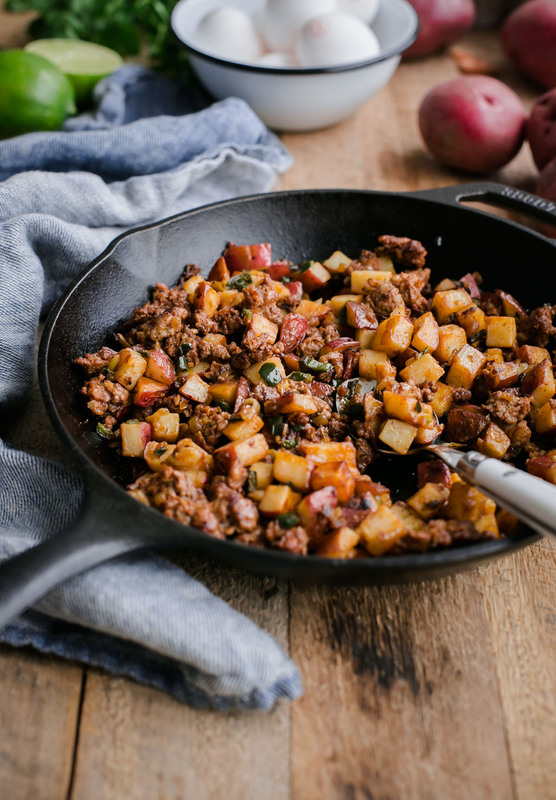 Instead of using bacon or ham, I substituted one of my favorite pork sausages in the hash: spicy bulk chorizo. 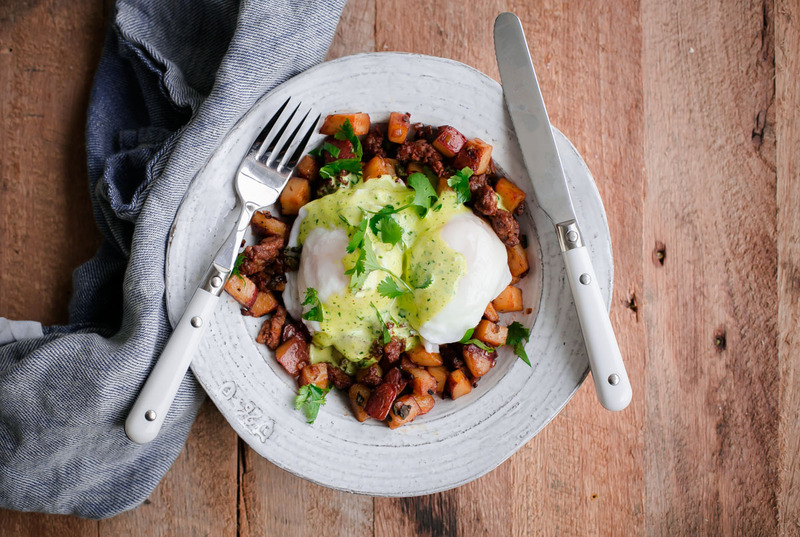 Lastly, the hearty, spicy potato hash is topped with perfectly poached eggs and a cilantro hollandaise sauce. If you’ve never made homemade hollandaise, I’m going to walk you through the whole process. 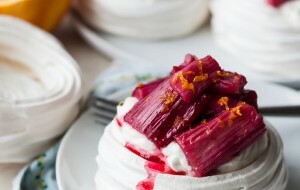 In the recipe below, I’ve also included instructions on how to hold poached eggs for a crowd. It essentially involves poaching the eggs in batches and transferring them to a warm water bath. If you’ve ever wondered how restaurants prepare poached eggs for hundreds of people every day, this is how they do it. You’ll be amazed at how well it works! The trickiest part to making hollandaise is emulsifying the ingredients properly and making sure it does not break. A high-speed blender (Vitamix, Blendtec, etc.) 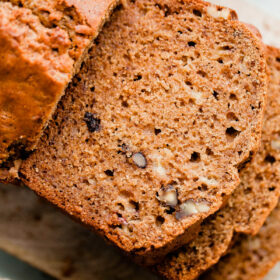 is the easiest kitchen tool to accomplish this task quickly and effortlessly! It takes most of the fear out of homemade hollandaise sauce. 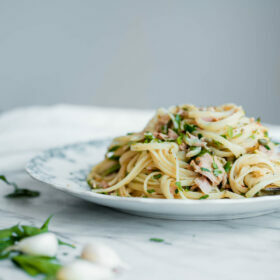 It is of the utmost importance that you follow the instructions and guidelines in the recipe precisely to ensure that you time and prepare the various parts of this dish in the right sequence. This is particularly essential for dishes that include more time-sensitive components, such as poached eggs and hollandaise sauce. 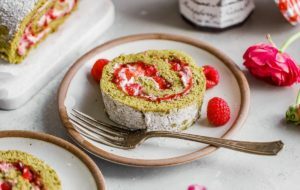 While this recipe requires a bit more planning and effort, it is perfect for the weekends or as a special treat when family come into town! 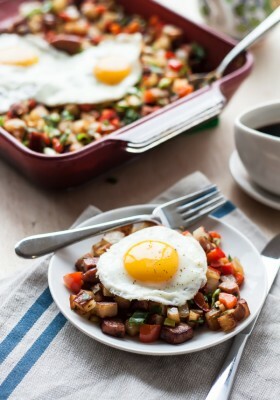 Prepare and cook the hash: Place the diced potatoes in a large saucepan and fill with cold, salted water. Bring to a boil over high heat, reduce the heat to a simmer, and cook the potatoes until just barely fork tender, about 3 to 4 minutes. Drain the potatoes in a large colander and leave them draining until ready to use (you want the potatoes to be as dry as possible before sautéing). Meanwhile, heat 1 tablespoon of extra virgin olive oil in a large cast-iron skillet over medium-high heat. Add the chorizo sausage and cook, breaking the sausage apart into small pieces, until crispy and caramelized, about 5 minutes. Transfer the sausage to a medium bowl with a slotted spoon, leaving any rendered fat in the skillet. Add the chopped onion and poblano pepper to the pan, sprinkle lightly with salt, and sauté over medium heat until translucent and lightly caramelized, about 6 to 8 minutes. Add the garlic and sauté for another 30 seconds or so, stirring frequently. Transfer the sautéed vegetables to the bowl with the cooked chorizo sausage. Heat the remaining tablespoon of olive oil in the skillet over high heat. When the pan is very hot, add the par-boiled potatoes, spreading them into an even, thin layer in the pan (avoid over-crowding the pan, sautéing them in batches if necessary). Add more oil as necessary. Cook the potatoes, tossing and flipping until caramelized on all sides, about 12 to 15 minutes. Add the ground ancho chile powder, cumin, and oregano and cook, stirring constantly, until fragrant, about 30 seconds. Season to taste with salt and pepper. Before serving, add the sauteed vegetable and chorizo mixture back into the pan and stir gently to combine. Keep warm until ready to serve..
As the potatoes are finishing cooking, prepare the poaching water: Fill a medium saucepan with salted, cold water. The water should reach about 2 inches up the sides. Add the vinegar. Heat the water over high heat until small bubbles begin to form at the bottom of the pan. Break one egg at a time over a fine-meshed sieve set over a bowl. Allow any loose egg whites to fall away into the bowl – this will eliminate any loose whites from disintegrating in the cooking water and result in clean, tight poached eggs. Carefully transfer the egg into a small ramekin or cup (if your eggs are extremely fresh, you can skip straining them). Repeat with three more eggs (placing it into their own ramekin/cup). *I like to poach, at most, four eggs at a time; if you are not familiar with poaching eggs, I recommend starting with two eggs at a time. Meanwhile, fill a large, shallow mixing bowl halfway with very hot tap water (this will be used to hold the poached eggs and keep them warm before serving). Set aside. Once bubbles begin to the rise to the surface (a very, very slow simmer) of the saucepan, slowly and gently tip each ramekin, one at time, into the pan – allowing the edge of the ramekin to touch the surface of the water. Set a kitchen timer for 4 minutes. After 30 seconds or so, use a spoon to gently flip the eggs. The eggs are ready when the whites are firm and the yolks feel soft when touched. Transfer the poached eggs with a slotted spoon to the bowl of hot water to keep warm as you cook the remaining eggs. Prepare the hollandaise sauce: Once the eggs are poached (and they are keeping warm in the hot water), place the butter in a small saucepan and melt over medium-low heat until lightly bubbling. 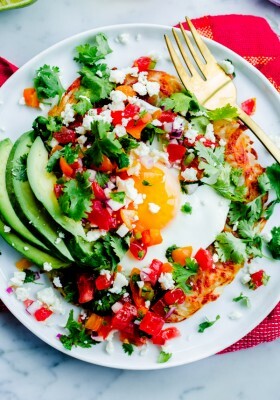 In a high-powered blender, combine the egg yolks, lime juice, and teaspoon of water. Blend over high speed for 30 seconds or so, until pale yellow. As the blender is running on high, slowly pour in the melted, hot butter in a very, very thin stream, allowing the mixture to emulsify. Add the cilantro leaves and pinch of cayenne, and continue to blend for another 30 to 45 seconds, or until thickened and pale green in color. Season to taste with salt and blend to combine. The hollandaise will thicken considerably as it cools, so it’s best to serve it immediately – if it gets too thick, you can loosen and re-emulsify it with a small spoonful of warm water. Remove and transfer the poached eggs from the warm water bath to a plate lined with a paper towel. 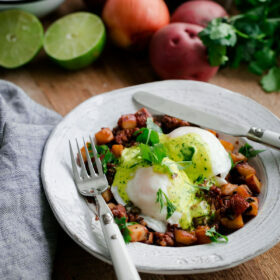 Serve the hash, top with poached eggs, and a generous spoonful of cilantro hollandaise sauce. Garnish with cilantro leaves and serve immediately. That’s the prettiest hollandaise sauce I’ve ever seen! I love me some Benedict and this looks spectacular. This sounds almost doable! I may be brave enough to try it! The way that one makes poached eggs ahead of time! Many thanks!